RW-Everything utility (or Read & Write Utility) is a powerful utility for hardware engineers, firmware (BIOS) engineers, drivers developers, QA engineers, performance test engineers, diagnostics engineers and anybody else who deals with computer hardware. RW-Everything features ability to access almost all the computer hardware, including PCI (PCI Express), PCI Index/Data, Memory, Memory Index/Data, I/O Space, I/O Index/Data, Super I/O, Clock Generator, DIMM SPD, SMBus Device, CPU MSR Registers, ATA/ATAPI Identify Data, ACPI Tables Dump (include AML decode), Embedded Controller, USB Information, SMBIOS Structures, PCI Option ROMs, MP Configuration Table and Remote Access. RW – Read & Write Utility is developed by Jeff Chan. It not only can access the hardware data, it allows the data to be saved to file, including ability to save as binary format. The data can be viewed Byte (8-bit), Word (16-bit) or Dword (32-bit) format. RW Everything also supports editing and writing of data into some hardware components such as memory and has command-line interpreter to access hardware manually. RW-Everything is now commonly used to display SLIC table to determine if SLIC 2.0 or SLIC 2.1 presented in BIOS to perform OEM activation of Windows Vista and Windows Server 2008, or Windows 7 and Windows Server 2008 R2, as it works in both 32-bit (x86) and 64-bit (x64) Windows operating system. 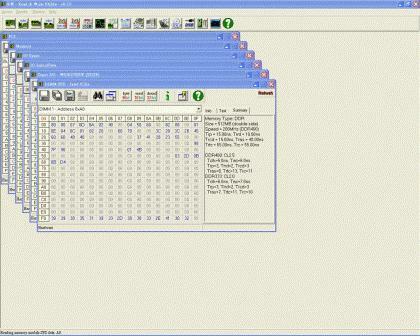 RW (Read & Write) supports Windows 95/98/ME/Win2000/Win3002/XP/XP64/Vista/Vista64/7/764. Note: For 64-bit OS, RW will switch the system to “Test Mode” after installation, this is because the driver is not signed. Uninstall RW-Everything will switch Vista x64 back to normal mode.